Obituary – Winkelman, Doris Joanne (Henderson) « Perry High School Alumni Association, Inc.
– daughter of Mr. and Mrs. Jimmy Henderson, 220 Fir, was born in Perry December 22, 1927, and attended the Perry elementary school. She is a member of Red Hots, triple trio, glee club, Rainbow, and the Degree of Honor lodge. She attends the Methodist church, where she is a member of the church choir. After graduation, Doris wants to enter training as a cadet nurse. 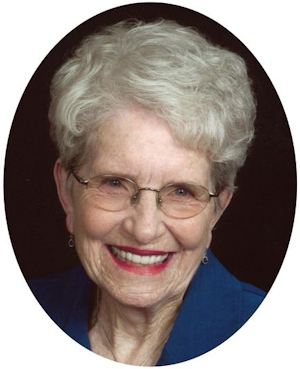 Doris J. Winkelman, 83, of Perry, Oklahoma was born December 22, 1927 at Perry and died Monday, July 18, 2011 at Integris Bass Pavilion at Enid, Oklahoma. She was the daughter of Jimmy and Leta V. Burger Henderson. She and Gorden Keith Winkelman were married in the Centenary Methodist Church in Lawton, Oklahoma on December 10, 1950. Gorden preceded his wife in death on October 4, 1984. Doris was a registered nurse. She was a member of the First United Methodist Church of Perry, the Esther Rebekah Lodge, United Methodist Women and the Petunia Garden Club. She enjoyed gardening, crocheting, reading and adopting stray kids. Funeral services will be at 10:00 a.m. Wednesday, July 20, 2011 at the First United Methodist Church in Perry. Rev. Ed Cook will officiate. The family will receive friends from 6:00-8:00 p.m. Tuesday, July 19, 2011 at BrownDugger Funeral of Home of Perry. Memorial contributions may be made to the United Methodist Church Circle of Care in care of BrownDugger Funeral Home, 1010 N. Seventh Street, Perry, Oklahoma 73077. Doris is survived by three sons and a daughter, Keith Winkelman and his wife, Thais, of Boulder Creek, California, Kenneth Winkelman and his companion, Dianna Lynn Reed, of Claremore, Oklahoma, Dr. Lynn Hodge and her husband, Dan Jr., of Perry, Oklahoma and Mark Winkelman and his wife, Jean, of Guthrie, Oklahoma eight grandchildren, six great grandchildren, one sister, Mary Carroll Stewart and her husband, Joe, of Fletcher, Oklahoma and several nieces and nephews. She was preceded in death by her parents, Jimmy and Leta Henderson, husband, Gorden Keith Winkelman, and one brother, Jimmy D. Henderson.